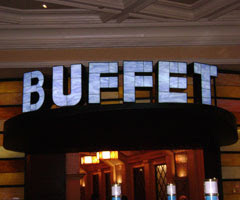 Originally, a central part of my intent in coming to Vegas was to go absolutely buffet mad and to go to at least four different buffets, write up reviews and even take digital pictures. After gorging myself at The Buffet at The Bellagio, widely considered one of the very finest buffets available in Vegas and therefore in El Mundo, I may have decided to cut back my goals, just a wee bit. Two buffet dinners and a buffet breakfast on Friday? *Much* more plausible. Perhaps not as in-depth as I might have liked, but I'll be back. I planned by first buffet based around Travel Channel's "All You Can Eat Paradise," which featured The Buffet at The Bellagio. The Line: At 6:30 on a Wednesday night, the wait was a little under 40 minutes. It looked like it would have been even longer if I had requeued at 8:45 when I left. Service: Soda and water are included with the price and there's a full bar. The usual assortment of staff whisk in and out making sure that plates are never left and that drinks are only occasionally empty. Ambiance: Very basic and almost entirely unthemed. Nice Asian-meets-Art-n-Crafts lamps hang over the line area, but the interior of the buffet is semi-classy and utilitarian. What about the food? After the bump, of course... After the bump. Including pictures! The Food: The human blueberry -- short, round, azure shirt, azure shorts -- in front of me in line assured me that although other buffets in the city may be more expensive -- the Wynn is apparently $40-ish, with longer lines -- none are better. Highlights: It's amazing how many things at The Buffet seem fresh. The main seafood station is, for many, an obvious standout with large shrimp, smoked salmon and giant crab legs. To my mind, the crab legs were too salty. I like mine crab legs natural and sweet. But folks were loading their plates. They know how to win at buffets. I preferred some of the smaller things at the station, including a shrimp-and-scallop ceviche, which had the sweetness I wanted from the crab legs, thanks in large part to the presence of mango. While obviously you don't win at a buffet by loading up on carbs -- EVERYBODY knows that -- The Bellagio takes great pride in their assortment of fresh baked breads -- at least five kinds that I counted, constantly being replenished. Bread is usually a trick, an afterthought, at buffets. This bread was good. The pizza was even better. They have a brick over out back and at least six different kinds of pizza were constantly recirculating including basics like cheese and pepperoni, a lurid green pesto and rock shrimp, and the BBQ chicken w/bacon pizza I had. The crush was good enough that I could have had more. Oh well. Only so much tummy. Plus, if you're at a buffet in Vegas, you have to hit the carving stations. The Buffet at The Bellagio has freshly carved lamb, perfectly pink prime rib, gyro trimmings (with fresh pita) and Chicken Wellington (I'd have preferred beef). For me, though, the best item was the duck leg in peanut sauce, which was amazingly moist for mass-produced poultry. There were entirely too many things I didn't try at the main stations, because the desserts looked too good. What other buffet do you know that has four entirely different types of bread pudding? 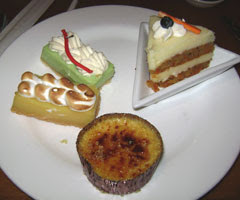 I sampled key lime pie, lemon meringue, carrot cake and the miniature ramekins of crème brulee without ever realizing that I hadn't gotten anything with chocolate. That's impressive. Lowlights: This is just a little detail, but if you're priding yourself on chilled seafood and sushi, what sane place surrounds those stations only with hot plates? I don't want to get back to my table to find out that my salmon roll has been cooked through. The Buffet prides itself on the freshly prepared foods, which is why the carving station and the pizzas are always turning over and staying in ideal condition. Somehow that didn't work out for the Generic Asian Station. Even if they were being regularly replenished, the dim sum-style steamed pork buns were always dried out and oddly crunchy. The Singapore noodles were also dried out and I couldn't really get a distinct flavor from there. Nothing else at the station looked worth grabbing. The fish at the sushi station was of fine quality, though a bit limited. Ahi and salmon. Period. Plus ahi and salmon poke. 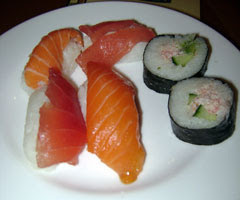 The rice with the various rolls had obviously been pre-formed in cannels, making it dense and chewy. The salad bar is a meager afterthought. Then again, once you're playing $30 for a buffet -- and even vegetarians could find a decent number of tofu and vegetabular items -- you probably shouldn't be loading up on leaves and dressing. Bottom Line: If it weren't for my desire to branch out and see the world, I could absolutely return to The Buffet at the Bellagio. There were many things I didn't get to that seemed appetizing. Meanwhile, The Buffet becomes gourmet on Friday and Saturday nights with the promise of Kobe-style beef. My previous recent buffet experiences in Las Vegas had been at the Tropicana and the Excalibur and the quality of the food at the Bellagio is noticeably higher. P.S. I have several options for tonight's dinner buffet, but if anybody has any suggestions they wanna share... go for it. Just do it fast. Buffet analysis! That's what I'm talking about! do I sense career change to food writer? Try out the Rio if you find your way there. I love buffets, and your use of "win" in regards to them is definitely something I am going to shamelessly steal. However, my first stop at the buffet is always, always the salad bar so I suppose I will never actually win. Oh, well. I love salad bars too much to give them up, even if it impedes my ability to consume massive amounts of crab legs. The Rio isn't as good as the Bellagio, but it's so darn big that the sheer volume of choices makes it a fine way to go. I can overlook quality if there are a lot of options to choose from. 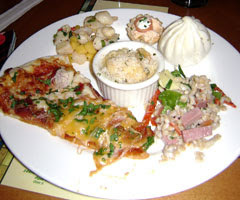 I also had a decent meal at the Paris buffet once, but that one is definitely in the $35-40 range, and I was really drunk so perhaps my view of the meal is a bit skewed. Otherwise the only Vegas buffets I've been to are the Tropicana (decent pasta bar, mediocre everything else), the Monte Carlo (YUCK) and somewhere on Fremont Street that I can't remember (fine for the price). Oh, and the MGM but that doesn't count because it was breakfast. I have nothing in the way of recommendations to make on buffets in Las Vegas, but it's fun reading you in food writer mode. PS - I would've guessed they keep the rooms chilled to 68 in Vegas, even on the skeevier side of the Tropicana. Hey, is there an Olympic breakfast buffet? I don't understand the purpose of a buffet in a world where I can get a McGriddle for breakfast and a steak from Planet Hollywood for dinner. I may be missing some subtlety of life. 1. There are only so many ways to do breakfast. Don't bother with one of the more expensive buffets for breakfast, nor judge a certain buffet on breakfast. 2. If doing sushi, go grab a plate from the desert line. Better odds of finding room temperature plates. 3. The Excalibur buffet is one of the worst in Las Vegas, and Tropicana isn't much better. Try Planet Hollywood for one of the best (outside of Wynn). Harrah's is a good compromise between the top-end buffets and Excalibur. I once hit that Buffet at 4pm after sitting on a plane for three hours before takeoff, then the five hour flight with my wife, mom and grandmother. Everyone was starving. We got in, paid the lunch rate, were there for the transition to dinner offerings. Heaven. One nice cheapish meal? The noodle place at the Wynn. Great soups.